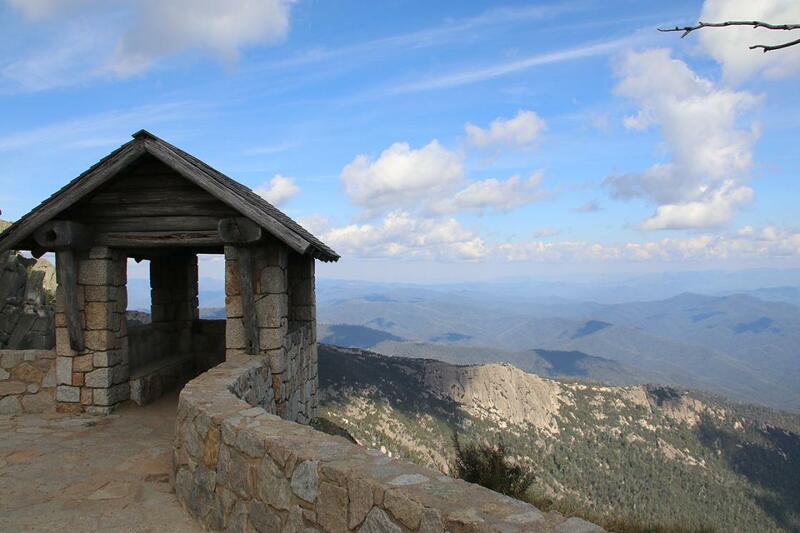 The Mount Buffalo National Park is a national park located in the alpine region of Victoria, Australia. The 31,000-hectare (77,000-acre) national park is located approximately 350 kilometres (220 mi) northeast of Melbourne in the Australian Alps. Within the national park is Mount Buffalo, a moderately tall mountain plateau, with an elevation of 1,723 metres (5,653 ft) above sea level. While staying in Porepunkah, Victoria we set off for a day trip into Mount Buffalo National Park - highly recommended. There is a fee to enter the National Park during winter as this is popular spot for skiing and tobogganing. During our visit in April the fees did not apply and our first stop after entering the park was the Eurobin Falls Track. Stopped for photos at Lake Catani. This is very popular camping site with plenty of tents, camper trailers, and even small caravans set up in the bush for a short stay in the National Park. There is a day visitor area beside the lake with picnic tables and portable toilets, and a walking track around Lake Catani which will take about one hour. On to the top of Mount Buffalo National Park to the Horn Picnic Area and then set off on the Horn Track to the top of a huge boulder. Very high with amazing views at 1723 metres above sea level. We witnessed some rock climbers ascending the side of this huge boulder and everyone asked them why they did not use the stairs. They were good humoured, and I found it hard to look over the side to see how steep it actually was. On our return journey down the windy road we stopped at Dingo Dell for a toasted sandwich and toilet break. This is a beautiful area of Victoria and I would suggest you pack a picnic and head out for the day exploring some of the many interesting walking tracks. have you been to Mt Buffalo NP? Explore Mt Buffalo NP - Porepunkah with RvTrips and find out where to stay, what to do and what to see. Helping caravan, motorhome and camper owners have a great holiday.